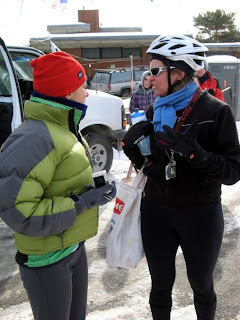 “I (Tricia K.) had an incident with a helmet during the Weston Winter Tri in 2009. It was a run-bike-ski event. After biking I didn't take my helmet off for the ski portion of the event. It wasn't intentional-my helmet is pretty comfortable and I didn't know I still had it on while I was skiing.